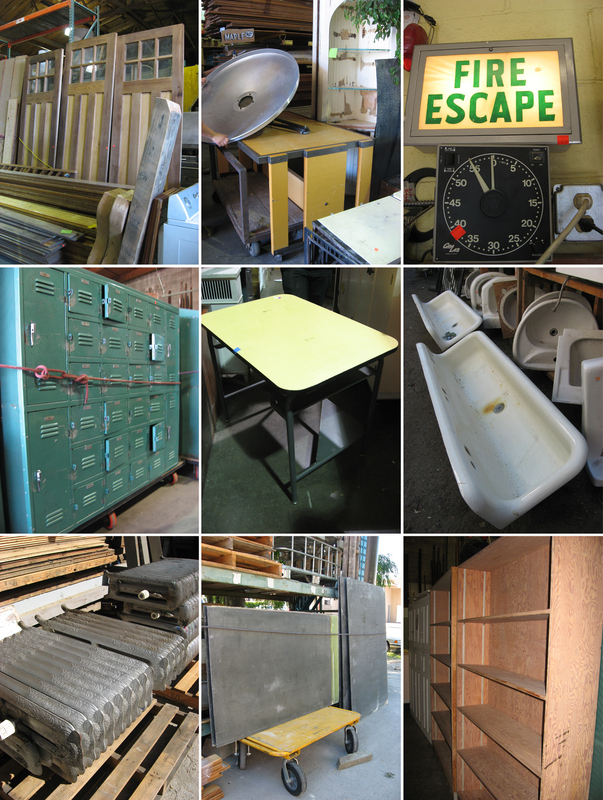 Our Seattle field crew has brought in all sorts of items from this week’s school salvage job at Old Pioneer Middle School in Steilacoom, Washington. Originally built in 1923, some of the items are from that time period: slabs of chalkboard slate, radiators and trough sinks. Lockers, bookcases (plywood and mahogany), and school desks all seem to be from the upgrades in the 1960’s. Some of the more random things that came to us from Old Pioneer are illuminated Fire Escape signs and a kiln vent hood. A new building was built for the middle school in recent years, and while the fate of the original structure is still to be determined, we were happy to get in there and salvage what we could! Also just in: custom doors from JAS Design/Build (above, top left). At 113″ tall, these 3 door panels will take a unique spot to call home, but they are beautifully crafted. Come check out these materials in the Seattle store now, and in Bellingham within a week or so.